The “I’d Like to Meet” prompt this week could have many twists… like to meet someone in today’s world, like to meet a friend for coffee, but like many genealogists… we want to meet someone not in this world anymore. But in as much as I’d love a sit-down with my 3rd great grandfather, Berrian Clark Bryan… just the two of us sitting on the front porch of his mountain cabin talking about the Civil War… I’m choosing my father – Harold “Clayton” Bryan! My father never talked about his years growing up or time spent in the U. S. Navy… why? Many men during World War II didn’t seem to talk about their time served… only opening up often in later years… but my father didn’t have that chance, dying at the young age of 54. Leaving me later yearning for more information… but very few family to ask questions of. I didn’t begin my family research until after the death of my father in 1983… I was only 31 years old, a mother of two young children… having no hours in the day to become involved in genealogy at that time. From all I’ve heard, daddy was a strong-willed boy… having a one-track mind of how he wanted to live. He didn’t like school and constantly skipped to play poker with the men at the local mill… where his father worked. Undoubtedly he was a good poker player, even at the young age of 12, and I’m told he always walked away with a pocketful of money. He also wasn’t very trustworthy when left home alone with his older brother… his parents came home one afternoon to discover the family chickens standing still in the yard… he had nailed their feet to the ground. The family ate chicken for a week, and he probably couldn’t sit for a week! Why were you such a bad boy growing up Daddy? You seemed to like to push your escapades to the limit… those poor chickens! I know you had several uncles a few years older than you… were you following in their footsteps with the gambling… did they teach you? I never heard if you ever got in trouble for drinking early, but if you followed your grandfather around town selling produce from his horse drawn wagon… well then, I’m sure you knew that those “supposedly” jugs of spring mineral water…. really had quite the kick! At the young age of 15, daddy ran away and joined the Navy… somehow he acquired a fake birth certificate. How did that happen in his small hometown… a birth certificate so good that even the Navy was bamboozled! His Navy badge showed his birth as 1925, but he was born in 1928. Could he really have looked 18 years old when he was only 15? I heard that story from my mother, but having the actual fake Navy ID proved it as the truth. He later re-joined the Navy when he turned 16; his father signed for him. He was giving an ultimatum after he quit school… either join the Navy or go back to school! I guess he hated school that much, as he opted for the Navy again. After joining for the second time, he then decided he really didn’t want to be there anymore, but when he called his parents to come get him… his father stood tough.. telling him he was staying! I guess my grandfather had had enough! Daddy’s ID Navy card showing a forged birth date of three years earlier! It wasn’t until after I sent away for my father’s records, that I began to have more questions, than answers for. Daddy served on two ships in the Navy, the USS Blue Ridge, and later the USS Washburn . The only thing my mother knew of his time in the Navy before he married her was that he jumped into radioactive water, which caused him to lose his teeth later. I can just picture him and his shipmates jumping off the ship with into the ocean… but I always questioned… why was the water radioactive? My inquisitiveness as to why the water was radioactive is what led me to research where he served during his Navy years! Being inquisitive as to which ships he served on, I turned to research them during his years spent in the Navy. The USS Blue Ridge was the first ship he shipped out on… immediately after boot camp in San Diego, California… leaving in guarded secrecy on June 12, 1946… what was daddy thinking… did he tell his parents where he was headed? What were you thinking Daddy, at the young age of 17, as you stood on deck sailing out under the Golden Gate Bridge? Did you look up at that huge red bridge as you sailed underneath, thinking how far you were going from your small hometown of Union Point, Georgia? What were you thinking at almost 18 years of age as you headed across the Pacific Ocean… not truly knowing where you were headed! Supposedly they were not told of their mission or where they were headed, but five days later, they arrived in Honolulu, Hawaii. What was it like daddy being at sea for 5 days… what rumors had you heard… and I bet you found a few card games to pass the time away! It was in Hawaii, where my father was probably was briefed and finally learned of where his ship was headed… especially after the General and flag officers of the Army, Navy, and Marine Corps came onboard to continue sailing with them. Daddy was headed to observe the Atomic Bomb Tests. The flag of Vice Admiral Harry W. Hill was hoisted on the USS Blue Ridge. History would have been so much more interesting to me in school if I’d known this… I could have learned about first hand information, but he chose to never talk about it. Why? Had it not been interesting to him… just a job? Before the USS Blue Ridge sailed from Hawaii, all were told to turn in their dress clothes, Navy blues and all white pants…. they were given field clothes. What thoughts must have raced through your mind… or maybe you didn’t really care… just going with the flo! Were you excited to be on this mission… did you fully know where you were going and what you would see… maybe you still didn’t even know that you were going to be part of history being made? He was soon en-route to Kwajalein Atoll… arriving there on June 28, 1946. From the many photos Daddy took while in the Navy… he always seemed to be having a good time! When I mentioned Daddy’s Navy clothes to my mother, asking if he came home with any… she said, “I only remember him coming home with the white pants and eventually I cut them up and made white slacks for me.” Mama was frugal… wasting nothing! My father was about to experience history in the making at Bikini Atoll… witnessing the first atomic bomb blasts. Even though his ship was a couple miles away from the blast, he must have heard and saw destruction… even they were given glasses to wear and told to turn away… I know my father… I’m sure he turned around. What did you see Daddy… or did it not even interest you? If only you had talked to me about your experience when I was in school… I would have been so proud to know that my father witnessed history! Hopefully you weren’t below deck in a high stakes card game! It was after this event, I’m assuming, when he jumped in the radioactive water… but where did you jump in at Daddy… off the side of the ship… which seems extremely high, and I’d think you would have gotten in serious trouble… or did you visit the lagoon area later and swim there? I did read that many men swam in the lagoon. So many questions… so few answers! Why didn’t I have these questions even before my grandparents died… possibly they could have answered them. Mama always talked of a book at their home daddy gave them on Bikini Atoll… but no one ever seemed to have seen it… did it really exist? Did he bring any souvenirs home… nothing has surfaced. Even though I can’t sit down with my father for that one last chat… I am thankful that I researched his Navy career and learned of his involvement in a great piece of our history… and I know he was there! 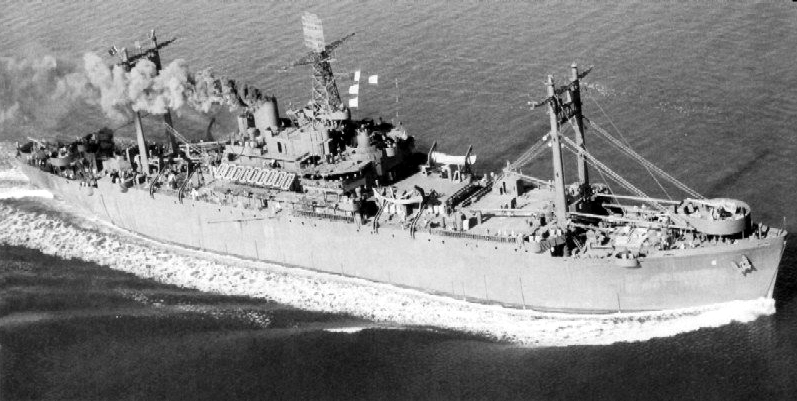 This entry was posted in 2019: 52 Ancestors in 52 Weeks, Daily Writings and funnies... and tagged 2019: 52 Ancestors in 52 Weeks, Bikini Atoll, Harold Clayton Bryan, USS Blue Ridge, USS Navy, USS Washburn. Bookmark the permalink. It sounds like your father had a fascinating life. I’m sorry you lost him too soon. Great post. Thank You! Yes I missed many stories from him. Wonderful story. Both of us Navy brats. Daddy never talked about his time in the Navy, either and I never pushed him. I have since found a bit of his records but nothing to the extent I’d like. I know all the ships he served on. Mostly destroyers. I’d have to look through my papers but if memory serves, Daddy was some kind of fireman. I also know he seemed to have a good time when on shore leave in California. I have several pictures of his time spent there. Daddy didn’t serve on either of the ships your Dad did. Daddy enlisted in August 1941. He was 8 years older than your dad. Oh the stories our dad’s could have passed on.